APNA, in partnership with Cancer Council WA and funded by the Australian Government Department of Health, has developed the National Bowel Cancer Screening Program – Guide for nurses working in general practice. 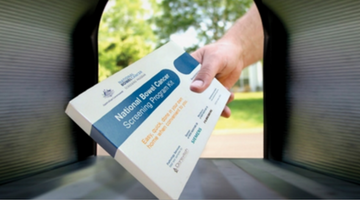 This guide contains information on the National Bowel Cancer Screening Program. The National Bowel Cancer Screening Program has released instructions for the newly released Home Test Kit. Home Test Kit Instructions - NEW for 2018! These resources have been designed to assist nurses in general practice to promote bowel cancer screening through the National Bowel Cancer Screening Program. This program saves lives – but it can only work with the support of general practices. The evidence is clear that a recommendation from a primary health care provider is an important motivator for participation in bowel cancer screening. If found early, 9 out of 10 cases of bowel cancer can be successfully treated. APNA held a live webinar National Bowel Cancer Screening Program: Webinar for nurses working in general practice on 1 March 2017. The webinar was designed to help nurses working in primary health care understand their role around the National Bowel Cancer Screening Program. Dr Hooi Ee has been a full-time gastroenterologist at Sir Charles Gairdner Hospital in Western Australia since 1998, where he has also held previous roles as Head of Department and Director of Endoscopy. He is the Clinical Adviser to the Department of Health WA on strategic and operational issues pertaining to the National Bowel Cancer Screening Program. He has also been co-opted to assist with revising the NHMRC’s Clinical Practice Guidelines for the Prevention, Early Detection and Management of Colorectal Cancer since 2015. His current clinical interests include general luminal gastroenterology, genetic colorectal cancer syndromes and endoscopy performance. Tracy has worked in general practice since 1990 in Mildura and Ballarat. She has also worked as a solo Women’s Health Nurse in Ouyen for Women’s Health Loddon Mallee for eight years. Her main areas of interest are health promotion and preventative health, women’s health, youth health and nurse-led clinics. Tracy completed a Master of Advanced Nurse Practice (Primary Care) in 2012 and now coordinates the Postgraduate Diploma in Primary Care Nursing at the Department of General Practice at the University of Melbourne. This project aims to increase primary health care nurses engagement with the National Bowel Cancer Screening Program (NBCSP), with the goal of increasing Program participation. This project is in partnership with Cancer Council WA, and funded by the Australian Government Department of Health. increased confidence and competency of primary health care nurses to support bowel cancer screening activities. improved resources, information and training for nurses working in a general practice setting on the NBCSP. This initiative is funded by the Australian Government Department of Health. The webinar is delivered by APNA with the support of Cancer Council WA.